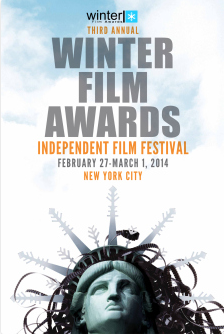 The Winter Film Awards Independent Film Festival (WFA), which takes place in New York City, returns for the third year and New York Film Academy students are welcome to attend! The festival is geared toward the NYC arts community and is a worthy destination on the US film festival circuit for out-of-state and international filmmakers alike. “The WFA Mission is to recognize excellence in cinema and to promote learning and artistic expression for people at all stages of their artistic careers with a focus on nurturing emerging filmmakers from around the world.” This year, WFA will be screening 61 Official Selections, which includes a diverse mixture of documentaries, shorts, narrative features, animation, music videos and horror films, including 8 student films, 17 female directors and representation from over 20 countries. WFA will kick off on February 26th with a reception and party. The festival weekend of screenings, panels and networking events continues at the Grayline Theater (777 8th Ave New York, NY 10036) from February 27-March 1. For more information on the Winter Film Awards, please visit www.WinterFilmAwards.com.